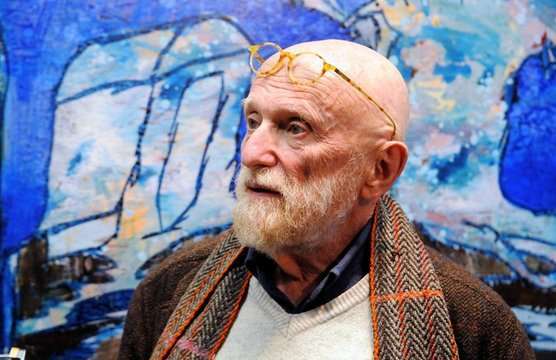 is a Belgian artist who lived and worked in France since 1951.His work is related to Tachism, Abstract expressionism, and Lyrical Abstraction. Alechinsky was born in Brussels. In 1944 he attended l'Ecole nationale supérieure d'Architecture et des Arts décoratifs de La Cambre, Brussels where he studied illustration techniques, printing and photography. In 1949 he joined Christian Dotremont, Karel Appel, Constant, Jan Nieuwenhuys and Asger Jorn to form the art group Cobra. He participated both with the Cobra exhibitions and went to Paris to study engraving at Atelier 17. Three years after he had his first exhibition in Paris and started to become interested in oriental calligraphy He exhibited Night, at Ohara Museum of Art, in Kurashiki and made a film: Japanese Calligraphy. In the early 50s he was the Paris correspondent for the Japanese journal Bokubi (the joy of ink), and left for Japan with his wife. By 1960 he had exhibited in London, Bern and at the Venice Biennial, and then in Pittsburgh, New York, Amsterdam and Silkeborg as his international reputation grew. His international career continued throughout the seventies and by 1983 he became Professor of painting at the École nationale supérieure des Beaux-Arts, Paris. In 1994 he was awarded an honorary doctorate by the Free University of Brussels, and in 1995 one of his designs was used on a Belgian stamp. He died in 1999. His works are held in the collections of the Royal Museums of Fine Arts of Belgium, the Tate, the Museum Ludwig in Cologne, the New York Museum of Modern Art, the Walker Art Center in Minneapolis,and the Museum of Art Fort Lauderdale, Florida.